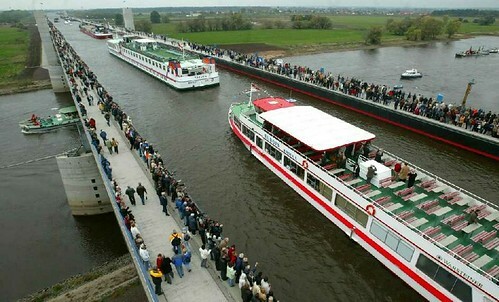 World's Largest Navigable Aqueduct - The Magdeburg Water Bridge is located near the town of Magdeburg, Germany. The 918-meter long aqueduct is an engineering masterpiece and it not only joins two German shipping canals Elbe-Havel Canal and the Midland Canal but also provides a ship crossing over the river Elbe. The construction of the link was started in the 1930s but due to WW-2 and subsequent division of Germany the work remained suspended till 1997. The aqueduct was finally completed in 2003. The channel is 34-meter wide and 4.25-meter deep and enables barges to carry loads of up to 1,350 metric tons. Hi Carter - A good question. The Water Bridge was designed by Grassl Engineering Consultans, Germany.